This entry was posted on November 8, 2008 at 6:15 pm and is filed under Art, Painting. You can follow any responses to this entry through the RSS 2.0 feed. You can leave a response, or trackback from your own site. Love the technicolor cows! A totally new vision of cow-dom. What drew you to them in the first place? Also, I’m curious about the sacred words. I’m fascinated by them, and like most people the first thing I did was try to read them…. And then I wondered if you meant them to be read at all. Any commentary on them? The Technicolor Cows began with the Santiam Longhorns which you can see in the Wild & Domestic Collection on my website. I found them in the Santiam Pass where my brother lived and, (always with a camera) stopped to photograph them. I was drawn to them immediately because of their immense size and yet languid demeanor in the pasture. 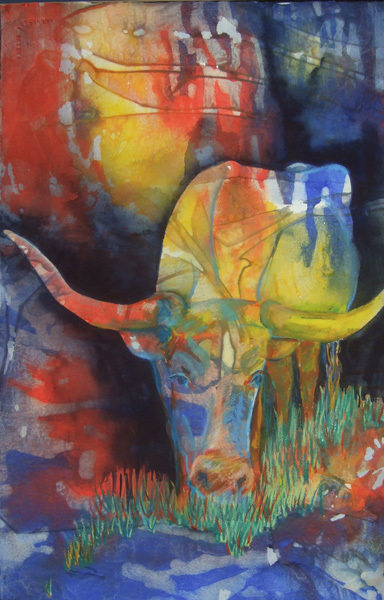 When I developed the technique of watercolor pours/watercolor crayon which began with the Opus series, I decided to use that technique with the Santiam Longhorns which was a transparent watercolor. The Sacred Words began during the Bush administration when I was so frustrated with the double-speak that was coming from the politicians to rationalize the need for the war in Iraq. Originally I had entitled the series Sacred Words Imperfect which I have sense changed to Sacred Words. The idea is for the viewer to determine the word that is in the image and in so doing, give thought to the word and its deepest meaning. Also, there is a paragraph or so explaining each collection which may give more insight to the series of paintings…check out the explanation of Technicolor Cows on the website.